Lot 28. Sicily, Messana. The Mamertinoi. 211-208 B.C. Æ hexas (22 mm, 7.16 g, 2 h). 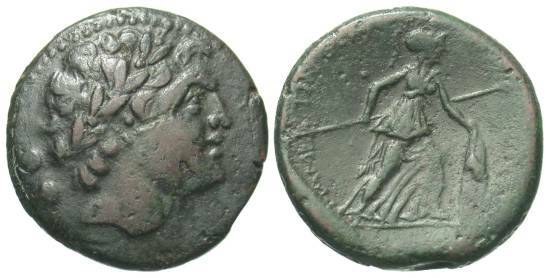 [APEOΣ], Laureate head of Ares right; behind, two pellets / MAMEPTINΩN, Athena advancing right, holding spear and shield. CNS I 23; SNG ANS 420-2; HGC 2, 848. Dark green and brown patina. Very fine.